Pileated woodpecker at work. Photo by John Charles Thomas. The Aftermath. Photo by John Charles Thomas. John Thomas took these photos of a lovely red-head, a pileated woodpecker who was hard at work during Saturday's snowstorm. "While shoveling during the snowfall this morning, I witnessed this large pileated woodpecker excavating two large holes on an Academy Avenue tree. This bird was not at all deterred from its work, even with a couple of us shoveling and clearing our drives as the snow fell. I have seen this bird several times, but he/she has normally flown away when I've seen it, so I was surprised that I could continue working outside with my shovel, and not cause alarm to the bird." 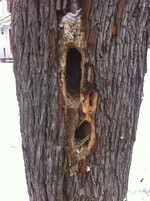 Later, John returned to see what the woodpecker had accomplished in a morning of work. The bird has created two holes, the top one about 12 inches, top to botto, and the bottom one about 7 inches deep! Great pics. I saw a pileated on the Grail property last Friday. The bird paid no attention to me as I walked beneath the tree it was working on.